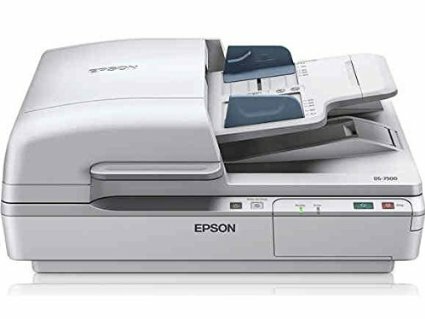 ENTER CODE: epson7500 AT CHECKOUT FOR EXTRA SAVINGS! High-speed, 2-sided document imaging, along with flatbed versatility, is right at your fingertips with the fast, affordable WorkForce DS-7500. This high performance scanner delivers remarkable scans from 4" x 6" and up to 8.5" x 40", quickly scanning 2-sided documents in just one pass. Use the 100-sheet Automatic Document Feeder (ADF) to scan stacks of one- or 2-sided documents. Or, use the 8.5" x 11.7" flatbed to scan hard-bound books or other odd-sized items. The DS-7500 blazes through each task at speeds up to 40 ppm / 80 ipm1. And, its 4 line CCD sensor (RGB and black) consistently delivers vivid colors and crisp, sharp text. Plus, with productivity software included and the optional network scan module, each member of your team can access high performance scanning for critical project needs. Max. Size 8.5" x 40"
Min. Size 4" x 6"
One year limited warranty in the U.S. and Canada.